But it was his role as goofy teenager in Bill & Ted's Excellent Adventure that propelled him into the big time, a role that, by his own account, he was born to play. "I'm a meathead," he once said. "I can't help it, man. You've got smart people and you've got dumb people." Self deprecation aside, Keanu transcended his Bill & Ted image when he showed up to good effect in such films as Point Break and My Own Private Idaho before jumping to superstar status when he jumped on the bus with Sandra Bullock in Speed . Keanu was chosen to play the lead in The Matrix (1999), and had another solid hit on his hands. Although he'd previously turned down the sequel to Speed , this time he signed on for not one, but two Matrix sequels. Despite a resumé that boasts over 40 films to his credit, his acting skills still don't receive any plaudits, but as long as he continues to bring audiences in at the box office, his career is thriving. 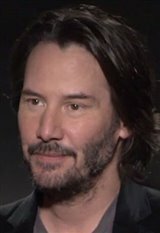 Keanu himself is pretty humble about his own role in the Hollywood hierarchy, a role he often lets slide in favour of playing bass with his rock band, DogStar. "I'm not considered like, you know, actors like Brad Pitt, or, let's say, Tom Cruise," he once said. "I don't have that kind of draw. You know, I'm just trying to be a working actor. Some people like what I do, some don't. There's not really much I can do about it. I'm trying, you know? I'm not the best actor in the world; I know that. But I'm trying." He's known as one of the kindest and most generous stars in Hollywood. On set, he gets to know the names of all the crew members and has also given up a portion of his salary on many movies to the crew. He often takes the subway and once pulled his car over to help out a stranger whose car had broken down on a highway. He's also incredibly patient. When a bouncer refused him entrance at the door for the wrap party in 2014 for a movie he'd starred in, he didn't tell the name he was the star of the film. Instead, he quietly waited for about 20 minutes in the rain until he was finally allowed in. In 2005, Keanu received a star on the Hollywood Walk of Fame. To the delight of their respective fans, he re-teamed with Speed costar Bullock for the romantic drama The Lake House (2006). More recently, he starred in 47 Ronin (2013), John Wick (2014), the 2015 thriller Knock Knock , as well as the 2016 films The Neon Demon , Replicas and The Whole Truth . Keanu's latest credits include John Wick: Chapter 2 (2017) with Laurence Fishburne, The Bad Batch (2017) with Jason Momoa and Replicas (2019) with Alice Eve.